Oak trees are among the most beautiful and revered types of growth in any yard, park or forest. It's not just their stunning and awe-inspiring appearance – most people familiar with trees know that it takes a good while to grow an oak tree from seed and will therefore appreciate a fully-matured specimen. This is why you can't afford to have your oak trees dying ahead of time. While fungal growth, bacterial infestation and overzealous pruning are often listed separately as common causes of premature tree death, they're actually closely related. When done moderately, pruning seems like a do-no-harm type of thing. After all, you're just helping the tree rid itself of excess branches, right? In reality, it's almost never that simple. The majority of fungi and bacteria that pester trees and shorten their lifespan will find their way into the tree through openings. Man-made cracks and holes as well as breaks on the tree's limbs caused by wind and similar natural conditions are essentially an invitation for unwanted visitors. Once these visitors have found their way into the tree, there might not be a way to get rid of them until you're forced to cut the tree down. This is why we always try to get our customers to frequently inspect their trees as if they were living beings (which they are! ), looking for any holes or cracks that could be cause for alarm. Doesn't this mean that you should always prune branches with holes and cracks on-sight? Not necessarily. During the summer and especially the spring, trees will leek a substance called sap from the holes where their limbs once stood. Being fairly nutritious, sap is a favorite of all manners of insects big and small who will frequently flock to the sap-leaking hole in order to feast while also potentially using the oak tree as shelter as they multiply. But it's not just insect infestation one needs to worry about here. While plenty dangerous on their own, these insects will often let bacteria and fungus hitch a ride and will carry them into the tree, creating a double-edged threat that can be exceptionally difficult to subdue and often leads to the tree's death. You can try to apply a sealant to the sap-leaking hole, but this isn't always a good idea as there are multiple substances that can cause further damage to a tree. Perhaps even worse, some believe that sealing the holes from spring and summertime pruning will impair the tree's natural healing ability and render it more susceptible to attacks. Your best course of action is pruning your oak trees during the appropriate season, that being winter. Winter pruning – the only acceptable kind? We prefer being called to prune during the winter because this is the time when we can guarantee best results. The tree is dormant, so there won't be much leaking sap to speak of – even if there was, the insects are dormant as well and will be far less zealous in their attempts to reach the tree. Pruning a tree while it 'sleeps' will also cause less stress overall – stressing a tree lowers its natural defenses and makes it more susceptible to infestation. As you can see, most of the negative conditions that can befall an oak tree are closely related and you should look to eliminate them all in order to have that beautiful old oak you've always wanted. While winter pruning might be preferable, not every trimming job during the winter benefits the tree. Owners will sometimes use (or abuse) the fact that the tree is dormant to make excessive trims in their attempts to alter the tree's default appearance. Just because a tree handles winter pruning better doesn't make it invulnerable and steps should be taken to ensure its vitality the same as during spring and summer. In some cases, autumn trimming might also be a necessary choice. While a far better one than trimming during the blooming period, keep in mind that most trees won't go dormant until the beginning of winter which is why many avoid touching a tree until late October. As a rule of thumb, the colder it is outside, the better your oak tree will react to pruning. Because it's difficult to count on November being as cold as it once was, try to do the bulk of your pruning in December and January, with February and March being potential candidates depending on weather conditions. The principles of pruning remain the same whether it's being done by property owners or professionals: look to minimize your influence on the tree and have faith in its natural shape and defensive capabilities. If you're doing the pruning yourself, make sure that the tools you're using are razor-sharp –dullness of the blades will cause additional stress as you struggle to separate the tree from its branch against its wishes. 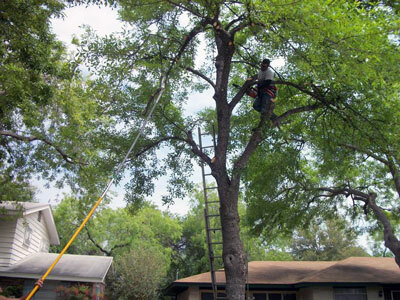 This is also why we urge tree owners to leave the pruning to us – we will always use the appropriate tools that will minimize the amount of unnecessary stress placed on the tree. More than one tree died from excessive trimming during winter – as already mentioned, cold days don't make the tree invulnerable. While we enjoy taking every opportunity to educate you on when and how to trim your oak trees (and all others as well), we stand by our belief that everything past the slightest pruning of the thinnest branches during winter should be left to the professionals.